Glass: Science and Technology, Volume 3: Viscosity and Relaxation provides notable developments in the field of glasses. This book contains seven chapters that specifically tackle the scientific and engineering aspects of glass viscosity, viscoelasticity, relaxation, and annealing. This book considers first the basis for the analysis of the data produced in relaxation experiments by testing a variety of mechanical models that help to define many of the viscoelastic properties and to establish relationships between them. 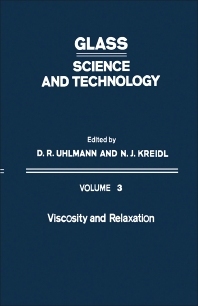 The subsequent chapters discuss the basic information on the rheology of viscoelastic substances; the atomic transport properties and structural relaxation processes; and the technological aspects of viscosity and its dependence on temperature, stress, time, and composition. This book further explores the physical mechanisms and theories of glass annealing. Separate chapters deal with the inorganic nonmetallic, organic polymers, and metal glasses. This book will be of value to glass scientists and researchers. VI. Is an Inorganic Glass a Linear Viscoelastic and Thermorheologically Simple Body? I. Why is Glass Annealed?